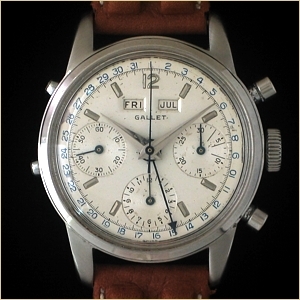 Powered by the groundbreaking Valjoux calibre 72C, the Gallet MultiChron Calendar was the first professional chronograph wristwatch to include automatically adjusting date and day-of-the-week features. 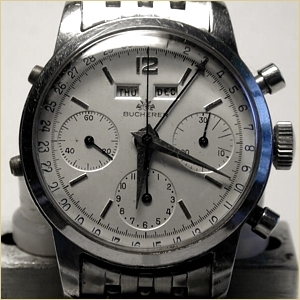 Coveted by serious collectors, only a limited number of these highly complex timepieces were produced as they were too expensive for the average consumer to afford. 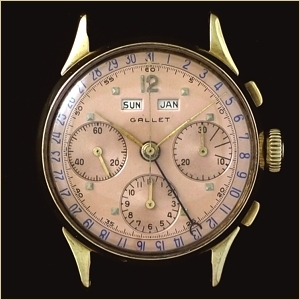 Except for the lack of a screw-down winding crown, the post 1956 Gallet MC Calendar shares many of the same components as the famous Rolex “Jean-Claude Killy” version, valued at nearly a quarter of a million dollars. 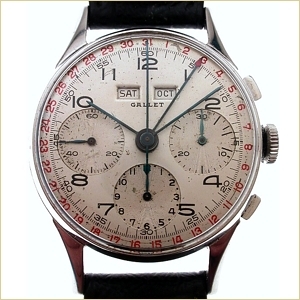 While original production records have yet to surface, many experts believe the Rolex version to be a collaboration between the 2 companies. 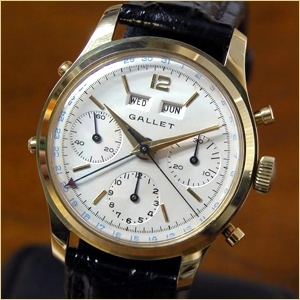 This is further supported by the fact that Gallet was the primary sales channel and wholesale distributor of Valjoux movements to other Swiss watch companies up until the mid 1970's. Model name: MultiChron Calendar "waterproof"